In the turn from the first to the second millennium, the hills of Galicia were covered with churches. Large or small, the temples were built over two centuries following a style, the Romanesque, which spread through the northwest rapidly in some territories and eased through the misgivings of more conservative people in others. The Santiago Way was the fundamental conduit for this art, perhaps the first entirely European in kind. One of its most beautiful examples is found in the interior of the province of A Coruña, in the Santa María de Mezonzo parish. It is impossible to resist photographing this church’s chancel. 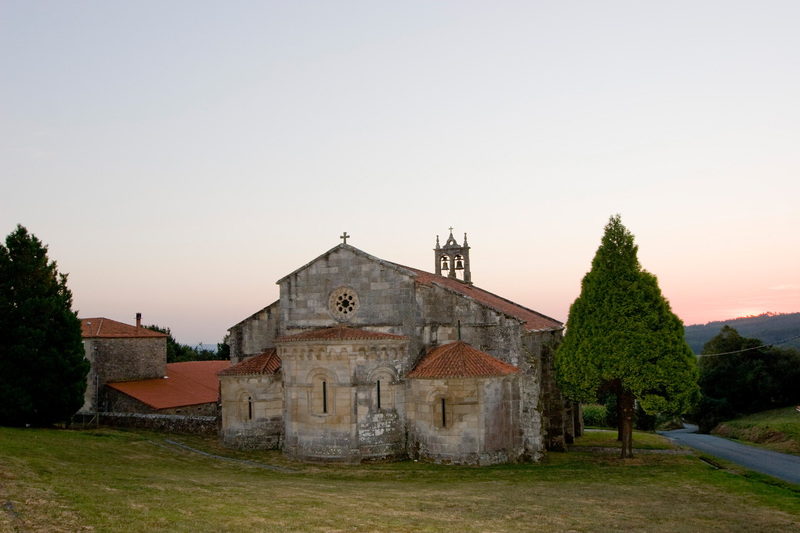 In addition to the balance achieved by the builders, the narrow windows under round arches and the rosette that gives light to the main nave, Santa María de Mezonzo is surrounded by one of the most beautiful rural landscapes in Galicia. The building was constructed on a hill that ascends from the Tambre river in the current Vilasantar municipality, in the livestock farming interior of a province perhaps best known for its coastal towns. Built certainly late for a Romanesque design, it dates from the early thirteenth century, Santa Maria de Mezonzo has a much earlier origin. It is all that remains of an old monastery, probably established in the time of the Suebi (fifth and sixth centuries) and which was highly relevant in the tenth century. The chancel and the facade are, oddly enough, very different: if in the back the Romanesque finds one of its more balanced and lighter achievements, the front of the temple presents itself as a stocky masonry wall, hardly interrupted by the door and a tiny opening for the light to pass through. The buttresses that support the west wall strengthen its solid appearance. By the time the interior was built, the Gothic was already a reality, which is evidenced by the pointed arches that support the roof of this small but beautiful building. The church is what remains of the monastery, which is known to have had an extensive library and to have been the place where one of the best known figures in the history of Compostela, San Pedro de Mezonzo, spent his first days as a clergy. He had been born very close by, in Curtis, in 930. After being ordained a priest in Santa Maria, he was abbot of Sobrado dos Monxes, a convent the monastery of Mezonzo belonged to, and later bishop of Iria Flavia and Compostela. The times he had to live through were not easy. Galicia was doubly mired in terror, that of the turn of the millennium, which made people read horrible signs in any natural event, and the one caused by Muslim incursions in some areas in the north of the Peninsula. One of these raids was carried out by the famous Almanzor in 997, when he reached Galicia in command of a fearsome army. After laying waste to Tui, he headed to Compostela, and San Pedro de Mezonzo ordered a city-wide evacuation. According to legend, when Almanzor entered Santiago, the only person he found was old Mezonzo, praying before the tomb of the Apostle. The Muslim leader ordered the saint not to be disturbed. Meanwhile, his troops were destroying the rest of the city and, also according to legend, bringing down the Cathedral’s bells to then transport them to Córdoba.